IndieWire visited the set during the last days of shooting to discuss life after death for FX's five-season, boundary-breaking rom-com. 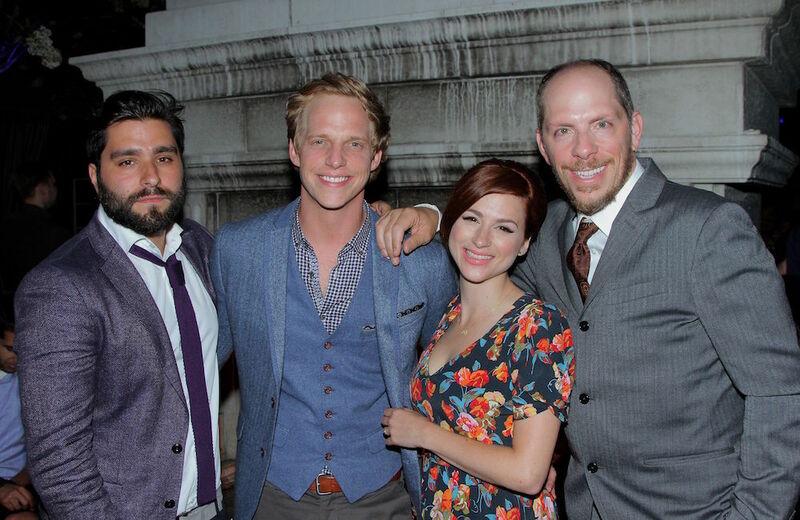 For the series finale, everyone — from the principal cast of Chris Geere, Aya Cash, Kether Donohue, and Desmin Borges, to a slew of recurring favorites like Janet Varney, Todd Robert Anderson, Brandon Mychal Smith, and the bear-adjacent Allan McLeod — is gathered to shoot a wedding reception as they swirl around the ballroom of a giant Silver Lake mansion decorated with ornate fixtures and lots and lots of taxidermy. It’s mid-September 2018, and it’s here, at the 22,000-square foot historical landmark of the Paramour Estate, that “You’re the Worst” will end its five-season run. The location’s intriguing history aside, its ties to the series run deep: It’s in the heart of the East L.A. neighborhood in which Falk’s series is set, and it’s also where Falk himself got married. Now he’s tossing on a suit jacket and directing his own daughter among the cast and crew of a show that’s “meant everything” to its creator. But what has it meant to everyone else? In the age of “too much TV” — a term coined by FX chief John Landgraf — how does a show without a truckload of Emmys or a “Game of Thrones”-sized audience measure its impact on the culture? What’s the legacy of “You’re the Worst”? It’s a difficult question to ask, even after the series wrapped and its creators have gone on their merry way. We won’t really know until five, 10, or 20 years from now, when whoever TV’s tastemakers are keep endorsing the rebellious romance between Jimmy (Geere) and Gretchen (Cash), or the fans continue watching old seasons of Falk’s FX rom-com on whatever platform exists then. FX, after all, is a division of Fox, which is now owned by Disney — and “You’re the Worst” didn’t even air its last four seasons on FX, but the upstart sister network FXX. Now, it may all be tied into Disney+, but where these shows exist and how people will access them for years to come remains a fluctuating mystery. “You’re the Worst” wasn’t the longest-running comedy, or the shortest; it didn’t get the best ratings, or the worst; it earned rave reviews and more skeptical assessments. But the genre-bending, oft-experimental series consistently held the respect of everyone watching. Jordan Vogt-Roberts, who directed the pilot and returned for three entries in the final season, said he doesn’t know how — or if — TV from this era will be remembered. One way to measure a legacy is what comes next. Look at how Vogt-Roberts’ career has changed from the time he shot the first episode back in 2014: The director who broke out with the Sundance hit “The Kings of Summer” in 2013 jumped from shorts and web series to the FXX comedy and then hit blockbuster status with “Kong: Skull Island.” Now, he’s attached to the “Metal Gear Solid” adaptation and an untitled monster movie with Michael B. Jordan. Geere had the longest resume coming into “You’re the Worst” — with four seasons of the British drama “Waterloo Road” and recurring roles in many other U.K. series — but this role introduced the actor to American audiences and Hollywood opportunities. Kether Donohue, who plays Gretchen’s best friend Lindsay in “You’re the Worst,” had what might be called an eclectic resume: She did the voice for Kiki Benjamin in the Tokyo manga series, “Mew Mew Power,” along with a dozen or so other anime roles, snagged a bit part in “Pitch Perfect” and was Pregnant Intern in a sketch on “Late Night with Conan O’Brien.” She only auditioned for “You’re the Worst” after impressing Vogt-Roberts during a car commercial he directed. Lindsay’s friend and former friend with benefits Edgar is played by Desmin Borges, who succinctly conveys his own transformation over five seasons. “I went from being a child to being an adult,” he said. “Since this show started, I shot the pilot — and my wife and I had been dating for three weeks — so I found my wife, we got engaged, we got married, we bought a house and had a baby in five years. Legacies are often carried on by children, and there are a lot of kids on the set. Though there are still two days left in the shoot, families aren’t just visiting to say goodbye. They’re part of the show. Darrell Britt-Gipson, who plays the rapper and Gretchen’s client Shitstain, is trying to keep his own wee one on the dance floor. “I’m done,” he says. “You want to dance again?” Britt-Gipson asks, but his son shouts “No!” and scampers off, only to return when A Tribe Called Quest’s “Scenario” starts blasting. Falk is bouncing between the on-set monitors, his roving cameraman capturing the cast getting down — including a particularly aggressive Brandon Mychal Smith jokingly grinding against Cash, who has a hard time keeping a straight face — and effortlessly grooving with his daughter, mouthing the words to the song the whole time. Nearby, Falk’s wife, makeup head Kristina Frisch, holds their newborn daughter, Flo. Certain seasons landed on plenty of critics’ “best of” lists, and the series landed two TCA Award nominations in 2015, but “You’re the Worst” never earned an Emmy or Golden Globe nod and live tune-ins never topped its premiere audience of 765,000. Still, the series had a clear cultural impact. Though the writers take zero credit for creating Sunday Funday, they noticed the phrase took off after they did an episode about the practice of drinking, brunching, and filling your Sunday with fun things to do. “You’re the Worst” also was one of the first shows to start an honest discussion about mental health on television. Gretchen’s struggles with clinical depression took center stage in Season 2, while Edgar addressed his PTSD (and the U.S. Army’s flagging support for veterans) in Season 3. As for the cast’s thoughts on legacy, Cash thinks “You’re the Worst” was “part of a wave” of comedies that redefined what audiences expected, in terms of tone and content. Donohue is happy that the series helped shift romantic expectations for anyone feeling like they don’t fit in with Hollywood’s version of love. Geere agrees, noting how he can’t even read romantic-comedy scripts anymore, praising Falk’s empathetic writing for changing how people connect with characters. Falk speculates about things like legacy and impact. He looks at his show not only in the granular details of characters and plot, but also in the macro sense; how it fits in with TV trends, and what it can do to separate itself. He’ll indulge morbid existential musings and take a stance on pertinent industry debates. But watching from his director’s chair as Falk dances with his three-year-old daughter Bernadette in a scene he’s directing, that he wrote, and alongside his cast, family, friends, and crew, it’s hard not to imagine the legacy isn’t merely this: The simple joy of creating something good. Be it a little girl dancing with her father on the very spot her parents were married, or bringing bold poignancy and earnest experimentation to a TV genre in need of a shot in the arm, “You’re the Worst” did so much for so many people, even when considering it’s all relative. “You’re the Worst” is available to stream on FX Now. Seasons 1 – 4 are also streaming on Hulu.